Located in the heart of Talmont-Saint-Hilaire, Vendée, Camping Le Loyada ***** welcomes you between ocean and forest for a successful holiday with family or friends. Only 3. 5km from the beach, you will enjoy an ideal setting for a pleasant stay. Renowned for its sun and sandy beaches, the Côte de Lumière is ideal for enjoying the benefits of camping. In addition to the joys of the ocean you can enjoy an aquatic area within the campsite with an indoor heated pool and outdoor, water slides and a paddling pool for children ... there is something for everyone! On the program: beauty treatments *, massages * well-being and men's / women's hair salon *. Throughout the season, the campsite will punctuate your stay with sports and games (sports tournaments, walks, water aerobics, pool games, village dances, coffee games, fun tournaments ...) for the whole family. * These punctual activities are set up at the initiative of the animation manager depending on the season and the number of people on the campsite. Throughout your stay, the campsite guarantees the care of your children from 4 to 12 years of age by offering them a balanced and stimulating play and sports program for each age group. Teens (13-17 years old) will also be welcomed in July / August in a dedicated club of animators will establish a tailor-made program, balanced and varied between fun and creative activities. For more comfort, the campsite offers a restaurant service with bar / snack, takeaway, a grocery store, wifi access, a laundry and the possibility to rent barbecues. To make your trip easier, a free shuttle to the beach is available in July / August. 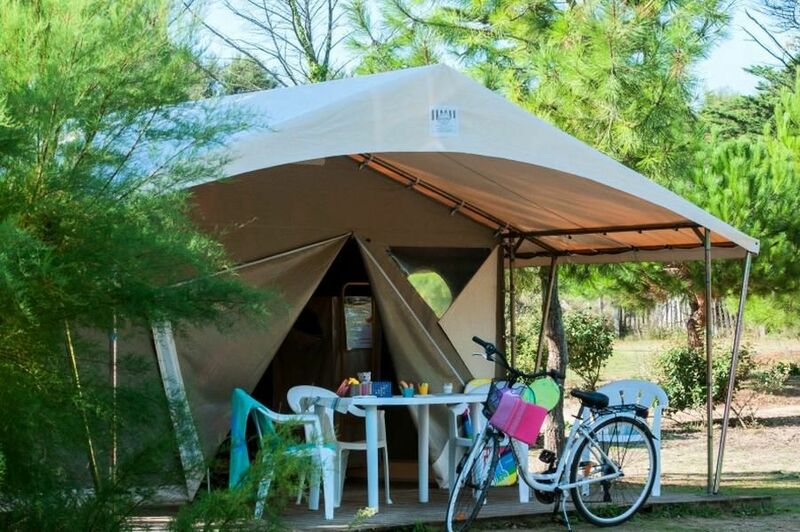 Inland, this campsite in the Vendée opens the doors for great family walks in the pine forests, but also in the Puy du Fou park. On the coast, you will have the opportunity to discover the rich heritage of the Côte de lumière, thanks to the visits that you can make on the island of Ré, the island of Yeu or the island of Noirmoutier. Tent Ecolodge 2 rooms 5 people composed of a common room with a kitchenette, a first room with a bed (140x190), a room with a single bed (80x190), a bunk bed two beds (80x190), and a terrace on the ground floor. The kitchen area includes a fridge. turn right at 1st roundabout Vitalys Cottages Saint Martin. Sables d'Olonne by the sea. At the roundabout turn right take Vitalys Cottages Saint Martin. Station des Sables d'Olonne (TGV direct from Paris). Nantes Atlantique Airport (100 km).